Part Used & Method for Pharmaceutical Preparations: The rhizomes are dug in winter. After the fibrous roots have been removed, the rhizomes are dried in the sun and cut into slices. The herb can be used either raw or carbonized. Functions: 1. To kill parasites; 2. To clear heat and release toxins; 3. To stop bleeding. 1. Parasites in the intestines: a) hookwormBasket fern (Guanzhong) is used with Torrya seed (Feizi) and Areca seed (Binglang); b) tapewormBasket fern (Guanzhong) is used with Omphalia (Leiwan) and Areca seed (Binglang); c) pinwormBasket fern (Guanzhong) is used with Chinaberry bark (Kulianpi) and Carpesium fruit (Heshi). 2. Wind-heat common cold, warm-heat maculopapule and acute parotitis. Basket fern (Guanzhong) is used with Honeysuckle flower (Jinyinhua), Forsythia fruit (Lianqiao), Isatis leaf (Daqingye) and Isatis root (Banlangen). 3. Extravasation of blood by heat manifested as vomiting of blood, epistaxis, bloody stool and functional uterine bleeding. 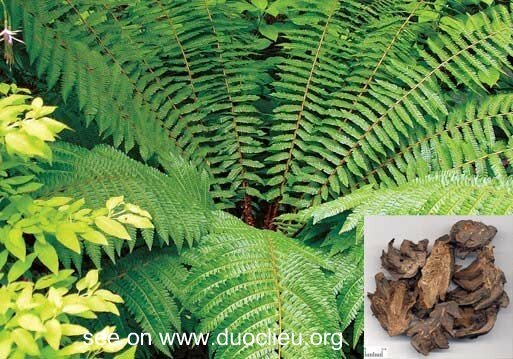 Basket fern (Guanzhong) is used with Biota tops (Cebaiye), Agrimony (Xianhecao) and Carbonized petiole of windmill palm (Zonglutan). Cautions & Contraindications: The carbonized herb is used to stop bleeding.